Without the enormous Russian material support, weapons, training, intelligence, troops, personal, diplomatic support etc. the Syrian regime would not survive very long. Russia has invested more than 55 years into this country and this regime going back to Soviet times. So the Russians are not going to give all that vested strategic interest up voluntarily. 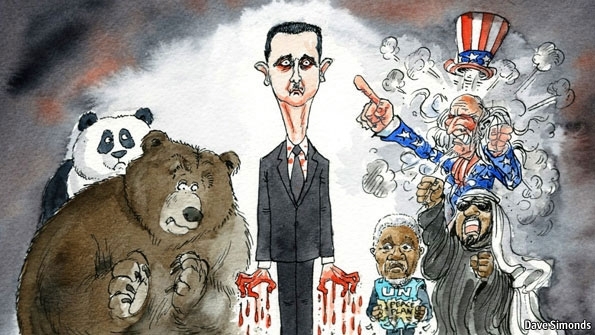 Regardless of how many civilians Assad is going to slaughter. To just give one small example of this Russian duplicity. While they “talk” about their support for the Annan peace plan another huge arms shipment was delivered toSyria. Thursday, May 24, a Russian arms ship, the Professor Katsman (owned by the Russian arms company Rosoboronexport), was detected outside Cyprus. The crew had shut down ALL communications systems, including its transponder, in breach of international regulations and crept forward in silence. The ship also refused to disclose its cargo manifests. The Russian vessel anchored in the Syrian port of Tartus Friday May 25. Military equipment was then unloaded behind tarpaulin screens and transferred to waiting Syrian military truck convoys. The cargo? Large quantities of artillery and tank shells as well as spare parts for tanks. And of course none of these shells is ever going to be fired at the Syrian civilian population, as they have been everyday for the last 15 months. And more arms are on the way, the North Korean arms ships Odai is also reported on its way to Tartus with hardware for the Syrian army. Rosoboronexport by the way is Syria’s main weapons supplier. Since 2007, Rosoboronexport has had a virtual monopoly on arms exports from Russia. •24 MiG-29 fighter aircraft, ordered in 2007 (delivery pending). Just to mention a “few” Russian arms deals. These are the people that Obama and his administration are basing their whole policy on that they, the Russians, are going to “change” somehow. In the “meantime”, every day Syrian civilians are slaughtered with Russian arms, Russian ammunition, Russian trained “soldiers” and “officers”, Russian advisers, sometimes directing at the “front”, and with the use of Russian intelligence. Without the enormous Iranian material support, weapons, training, intelligence, troops, personal, diplomatic support etc. the Syrian regime would not survive very long. 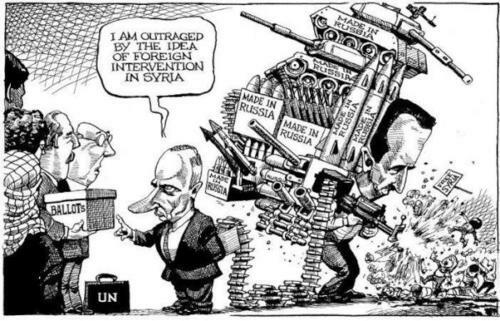 Between Russia and Iran, there is a division of labour of how they support Syria. Iran, usually, has more troops, personal, advisors etc direct on the “front line” where the direct slaughtering is going on. Assad TOTALLY depends on Iran (together with Russia and China) for his survival. For Iran, Syria plays a vital roll in its ambitions to control parts of the Middle East. In addition, Syria is crucial for Iran’s support and control of Hezbollah and Lebanon. And Hamas in Gaza. For the first time the Iranian regime have openly admitted that it has troops in Syria and is actively supporting the Syrian thugs. On May 27, the semi-official Iranian Students’ News Agency (ISNA) first published and then removed an interview with a senior member of the Islamic Revolutionary Guard Corps’ Quds Force in which he said Iran is involved inSyria. “Someone” understood what a blunder this was and pulled the plug a few hours later. He also claimed that ”if the Islamic republic had not been present in Syria, the massacre of its people would have been multiplied.” SIC! And he said: ”Despite all the problems that the Syrian government has — and we have asked them to address those — Syria is a location of resistance. The reason for all the pressure from the U.S. and Israel is that they have realized the country is impossible to occupy”. In another twist of fate, Hezbollah, with over a 25-year record of kidnapping and murder against Israelis, Americans and other Westerners, have had a taste of their own medicine. In two incidents, Hezbollah operatives were kidnapped by the Syrian opposition. 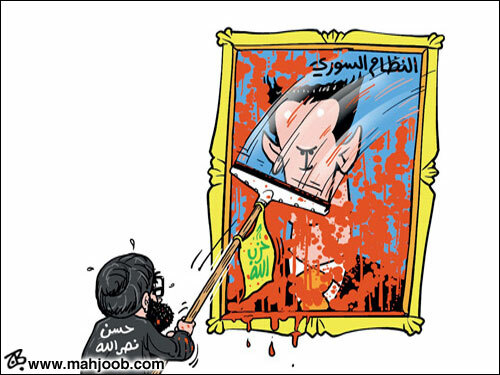 You should remember that Hezbollah, together with Iran, actively has helped the Assad regime against his own people. The first group of eleven was captured on May 22 in a bus heading home through Aleppo from Iran. The story was that these people were “pilgrims” returning. In reality, they were Hezbollah operatives. They are now held by FSA. The second and much more serious for Hezbollah was a very sophisticated commando raid outside Damascus, where 5 top Hezbollah officers was kidnapped. This has sent shock waves through Tehran and the Al Qods Brigades command there. The unidentified commandos, guided apparently by precise intelligence, ambushed a Hezbollah car 15 km west of Damascus after they left the Syrian military base of Al-Hame 4 km from the Syrian capital. And captured five top-ranking Hezbollah officers. A sixth escaped. Al-Hame is one of the two big military bases Hezbollah has outside Damascus. The other one is in Al Zabadani. It is there that Hezbollah maintains its heavy Scud D long-range missiles, as well as it’s more sophisticated and advanced hardware and missiles/rockets it intends to use against Israel. One of the kidnapped Hezbollah officers was Ali Safa, a senior officer of Hezbollah intelligence and nephew of Secretary-General Hassan Nasrallah. The kidnapped also included Hussein Hamid, Dep. Commander of Hezbollah forces in South Lebanon; and Ali Zerayb, member of the Hezbollah Jihad Council. This is part of Hezbollah core leadership so no wonder Tehran is worried. It is said that Obama is doing nothing in Syria because he does not want to “disturb” the nuclear weapons negotiations with Iran. Negotiations that have led nowhere during all these years. In the meantime, Iran is SO MUCH closer to make nuclear weapons, if it decides to do so. At the same time, every day Syrian civilians are slaughtered with Russian and Iranian arms, Russian ammunition, Iranian led “soldiers”, Iranian advisers and with Iranian intelligence. Without the Chinese material support, weapons, training, intelligence, personal, diplomatic support etc. the Syrian regime would not survive very long. The Chinese support is however on a smaller scale than Russia and Iran. China helps Assad mostly through its sanction busting system it has set up to help Iran. China has helped Iran to sidestep the regular global financial system to create a huge clandestine money-transfer, commercial and currency exchange machine for getting around the US-led Western sanctions hurting Iran’s international trade. They are assisting in the construction of this underground network as a pipeline through which Iran can continue to conduct its commercial business with the outside world. And to help Iran evade the financial isolation because of the sanctions regarding its nuclear weapons program. This entry was posted on 6 juni, 2012 at 1:15 f m and is filed under Fri- och rättigheter, Syria, USA, Yttrandefrihet. You can follow any responses to this entry through the RSS 2.0 feed. You can leave a response, or trackback from your own site. quick question in which I’d like to ask if you doo not mind. I was interested to know how you center yourself and clear your hewd prior to writing. trying to figure out how to begin. Any deas or hints? Cheers!